I’m not usually a fan of casseroles, not a fan at all. But I love this one! 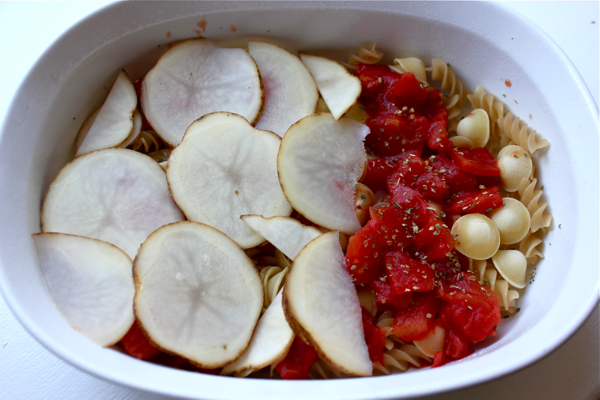 There are layers of pasta, tomatoes, chicken, onion, and potato. 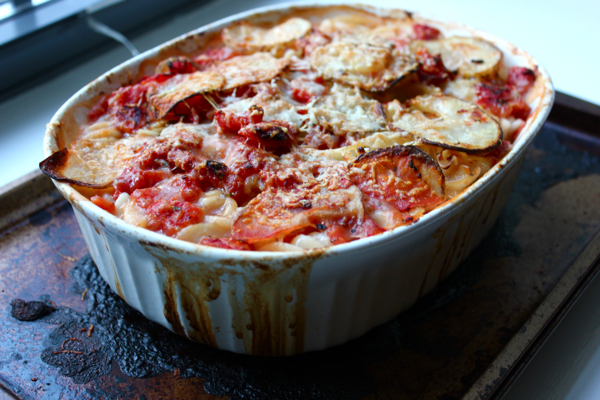 It’s like a cross between baked ziti and lasagna, except that everything in the dish is uncooked when it goes into the oven- even the pasta! If you have kids around, this would be a really fun meal to assemble together. 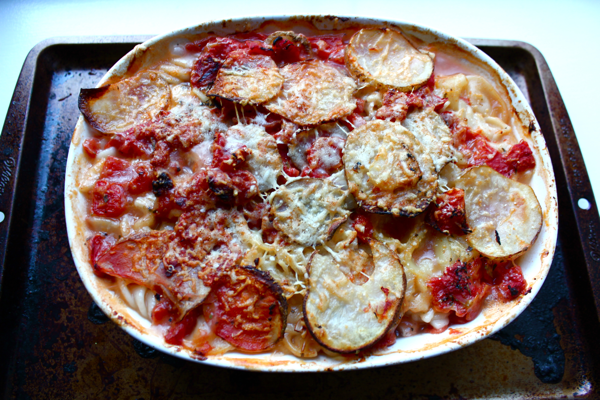 To make this interesting pasta bake, start by preheating your oven to 400ºF. Also, bring 3 cups of water to a boil and then remove it from the heat. Then, grease an oven-proof dish. Mine was 1.5 quarts, and it held about 3 servings. Choose a pasta that takes a while to cook, like rigatoni, and spread it in an even layer in the bottom of the dish (about 1/4 pound). I used a mix of whole wheat fusilli and regular orecchiette pasta. The whole wheat had a shorter cooking time (8 minutes), and it got mushy in the casserole. The orecchiette had a 12 minute cooking time, and it came out much better. 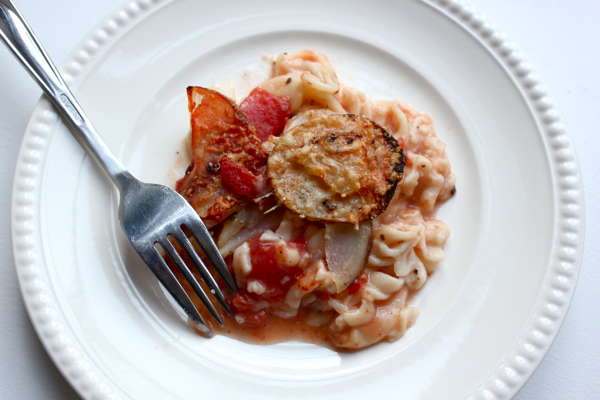 If you’re going to mix pastas, use ones that are more similar. Next, layer on 1/3 of a can of diced tomatoes. Sprinkle them with 1/2 tablespoon of dried oregano. Then, layer on 1/2 of a very thinly sliced potato. Dice 1/4 of an onion, and sprinkle those pieces in as the next layer. 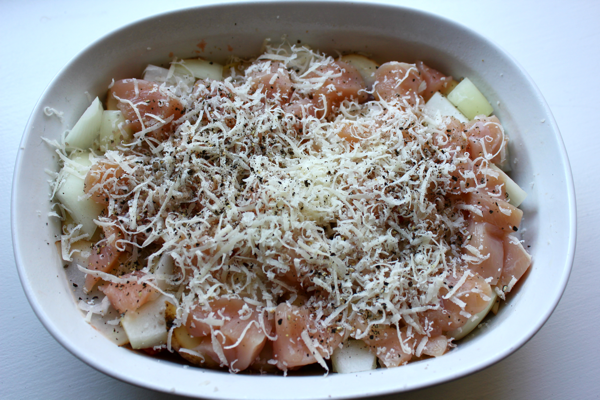 Then comes 1 raw, cubed chicken breast and a sprinkling of shredded mozzarella cheese. Season everything with 1 teaspoon of coarse salt and some black pepper. We are still layering! Add in another layer of pasta, followed by another 1/3 of the canned tomatoes. 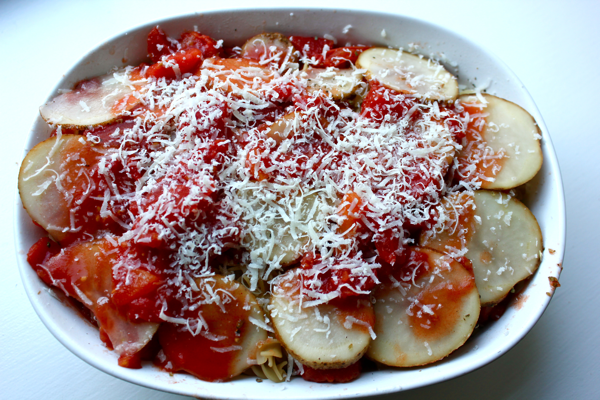 Season it with 1/2 tablespoon of oregano, and cover it with the other half of the sliced potato. Season the top with 1 teaspoon of coarse salt and some more black pepper. Drizzle the rest of the tomatoes on top of the potatoes. Now comes the really fun part. Place your casserole dish on a rimmed baking sheet, and pour in the water you boiled earlier. You want to fill the dish up to the top layer of potatoes. Cover the dish with tinfoil, and let it bake in the oven for 1 hour. After that time is up, remove the tinfoil. Sprinkle over 1/4 cup of shredded parmesan cheese. Put the casserole back into the oven for 15-20 minutes until the top layer of potatoes and cheese begins to crisp up and brown. This top layer is my absolute favorite!! When you remove the casserole, let it rest for 10 minutes before serving it. And now it’s finally time to eat! Serve your pasta with something green like steamed broccoli or a fresh salad. I will definitely make this pasta bake again. Out of guilt. Because I ate the leftovers for lunch, and they were the first thing David asked for when he returned home a few hours later. You snooze, you lose! This recipe was adapted from Martha Stewart’s Everyday Food magazine, Nov. 2009.